Stocks like JPMorgan Chase and American Express are on the ropes today due to comments from St. Louis Fed chief James Bullard. The market's fear may be your opportunity. The Dow Jones Industrial Average (DJINDICES:^DJI) opened trading Thursday with a triple-digit slide before recovering to a less severe 81-point decline by 1 p.m. EDT. The movement came on the heels of lower than expected consumer spending in May and talk of higher interest rates from St. Louis Federal Reserve Bank President James Bullard. Twenty-nine of the 30 Dow components were down at the time of this writing, with particularly bearish movements from the index's financial components. American Express (NYSE:AXP)was down 1% by early afternoon and megabank JPMorgan Chase (NYSE:JPM) had shed 0.7%. No other industry is as directly connected to a changing interest rate landscape as banks. These companies use macroeconomic rates to set prices for both loans and deposits. The difference between the interest rate a bank charges for its loan products and what it pays for its deposit products is its primary driver of profitability. When interest rates change, the transitional period is marked by a few factors that can be problematic for banks and bank investors. However, in the long run higher rates generally mean that the spread between loans and deposits will grow (and bank profits will then follow suit). First and foremost is demand for loans. When rates rise, loans become more expensive, making the value proposition of accepting that loan offer more difficult for individuals, small businesses, and large corporations. Last summer, for example, a sharp rise in mortgage rates effectively ended the mortgage refinance boom most banks were relying on to drive revenue during the post-recession "new normal." That slack in the refinance market continues even into 2014. As of the end of the first quarter, JPMorgan had seen a 32% sequential drop in its retail mortgage business and a 24% drop in its wholesale mortgage business. Second, loans and deposit rates don't necessarily change at the same pace. For example, many loans have fixed interest rates that will never change. Loans could also be adjustable rate, but only reset at certain times. This reset period could range from two to five to even seven years. Deposit products generally reset much faster than this, causing a potential short-term squeeze on the bank's margins. That said, there are significant and pertinent long-term positives from rising rates. The Fed's move to boost rates would indicate that the broader economy is sufficiently recovered to handle the short-term shock. That was Bullard's point today. Bullard said inflation is turning around and making its way toward the Fed's 2% objective. Excessive inflation is generally bad, but moderate inflation indicates healthy and self-sustaining growth. And that strong growth is exactly what this economy has been missing for going on six years now. 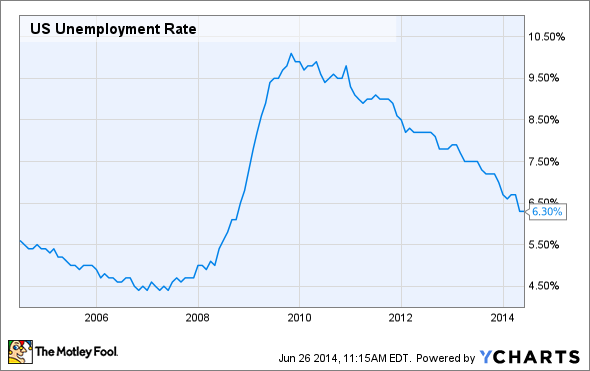 The labor market is vastly improved and seems to be gaining more momentum each month. Gross domestic product disappointed in the first quarter, giving Bullard and others "heartburn," but most economists agree that the 2.9% decline in U.S. productivity was an anomaly. The consensus is for second-quarter growth to meet or exceed 3%. Speaking to the bank industry specifically, higher rates will generate more profit. In the bank's last annual report, JPMorgan CEO Jamie Dimon estimated that a return to higher, more historically normal rates would boost the bank's profits by $6 billion annually. That's a 25% increase over the bank's 2013 adjusted earnings, after tax. For most of the larger banks -- the JPMorgans and even American Expresses of the world-- the transition to higher rates will not be as horrible as the market seems to expect. These companies have sophisticated interest-rate risk models that mitigate possible scenarios. The result of this hedging is smooth earnings even as rates move higher. 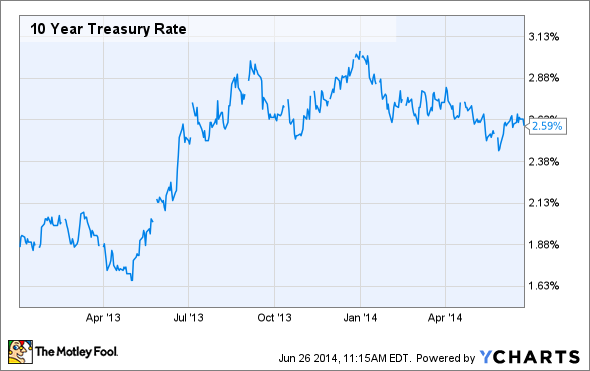 If rates do rise sooner rather than later, that is a long-term positive. It is an indication of a strong economy and, specifically for banks, a sign of profit growth ahead. The market reaction today is overly concerned with the end of cheap money and the possible short-term impacts of a sooner than expected change in interest rate policy. Keep your eyes focused on the long term, as this volatility will almost certainly present some very lucrative opportunities.